Jonathan Rea celebrates his World Superbike double in Thailand. Jonathan Rea was in a league of his own as the Kawasaki World Superbike rider completed an imperious double in Thailand to seize control of the championship on Sunday. The Ulster has chalked up four straight wins after also claiming a brace at Phillip Island in Australia last month on the Ninja ZX-10RR. Rea has already built up a lead of 30 points over nearest challenger Chaz Davies (Aruba.it Ducati) after the first two rounds of the series. The two-time world champion, who is aiming to make history in 2017 by becoming the first ever rider to win the title three times on the trot, dominated over the weekend at the Chang International Circuit in Buriram, where he has now won five races out of a possible six since the venue was added to the calendar in 2015. 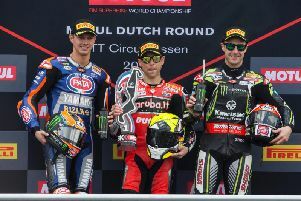 Rea again proved unstoppable as he surged through from the third row of the grid in the re-started second race, eventually wrapping up his 42nd career World Superbike triumph by four seconds from team-mate Tom Sykes, with Ducati’s Marco Melandri completing the top three. A delighted Rea said: “The best start to a season ever in my career. It is important to maximise these points when we can because it is how I built my championships in the past. “When we can win, make sure we win, and then we can try and consolidate. These four victories are nearly halfway to my win tally from last year already. It is a good start and I just feel comfortable on the bike. “We took the bike set-up we had from Phillip Island to here and it just pretty much worked,” he added. Race two was stopped due to a red flag when Milwaukee Aprilia’s Lorenzo Savadori crashed out, leaving debris on the track. Rea’s anticipated chief championship rival, Chaz Davies, slid off on the third lap and was forced to fight his way through from 19th place in the 16-lap re-start. Davies eventually claimed some vital points as he crossed the line in sixth position on the Panigale R.
Pata Yamaha’s Alex Lowes continued his promising start to the season as he finished fourth ahead of Spain’s Jordi Torres (Althea BMW). In stark contrast, it was a weekend to forget for Toome’s Eugene Laverty, who was ruled out of the first race on the final lap on Saturday with a technical problem on his Milwaukee Aprilia. Laverty, making his return to the series this year after two seasons in the MotoGP premier class, had been lying in seventh place at the time on the RSV4. The 30-year-old was optimistic of making amends in race two, but Laverty suffered more misfortune when he slid out on the fifth lap. The 2013 championship runner-up managed to remount and earned a point as he took the flag in 15th place.